Wow - this just jumps out of the page! Beautiful Debra! Looks good enough to eat!! How very appropriate. I am reading the blogs to which I subscribe (yours included) eating my Shredded Wheat and Bran with blueberries and kiwi. Yours look good enough to add to my bowl. I think your fruit paintings are so skillful. 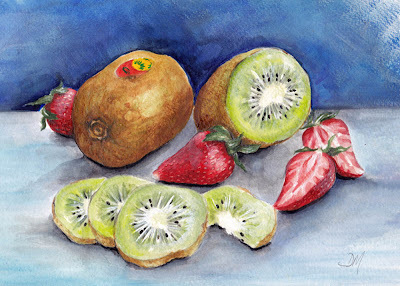 I like the texture on the outside of the kiwi fruit, and how it contrasts with the inside, and the strawberries. Well done. Both this and the previous of the strawberries are just wonderful! I love how you paint! Beautiful texture, high lights and shading and I like the layout again of the subjects. Really well done!!! Debra these colors are so beautiful together! Your composition is beautiful. I love the shadows and highlights.